This citrus sauce is also tasty on sea scallops. It can be kept in the refrigerator for up to 7 days. Heat a nonstick saute pan to medium-high heat. 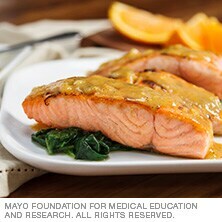 Place the salmon fillets skin side down on a plate and season with cumin, orange zest and salt. In a medium bowl, combine the orange juice, apple juice, mustard, honey and black pepper. Add the olive oil to the heated saute pan. Place the salmon in the pan, seasoned side down. Cook for approximately 2 minutes, flip, and cook another 2 minutes or until an internal temperature of 145 F is reached. Remove salmon from the pan and set aside; cover. Add the juice mixture to the saute pan. In a small bowl, combine the water and cornstarch to make a slurry. Slowly whisk the slurry into the juice mixture, continuing to whisk until the desired thickness is reached. Drizzle the sauce over the salmon and serve.